Margaret asked about the sleeve redraft for the Vogue 8436 jacket; I thought it would be easiest and possibly helpful to others too if I just posted a picture of my altered pattern piece. 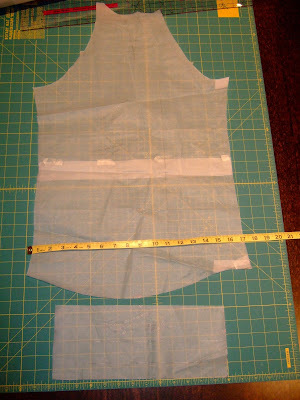 Above is the original sleeve pattern piece (>24" wide at hem) and cuff. I made several slashes from the wrist up to the underarm and overlapped the slashes so the hem was about 17" wide, including seam allowances. I retraced the piece and got the sleeve you see below. You can see the hem is a little more curvy now, and this is asymmetric. Also, instead of tracing a perfectly straight sleeve seam, I curved in just a tad because I thought I would like this look. Another thing I didn't mention before is that I lengthened the cuff so the finished width is 2", and I shortened the sleeve to compensate for that. 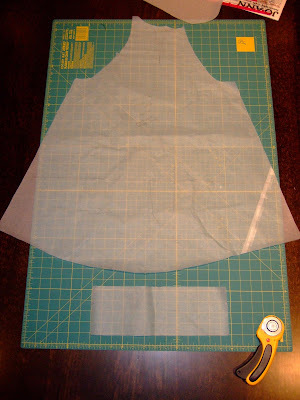 You did a fabulous job altering the sleeve for this pattern! Thanks for sharing this info with us!